Sales contact Questions? Find a contact in your vicinity. Pressure balances (dead-weight testers) are the most accurate instruments available on the market for the calibration of electronic or mechanical pressure measuring instruments. The direct measurement of the pressure (p = F/A), as well as the use of high-quality materials enable a very small measurement uncertainty, in conjunction with an excellent long-term stability. 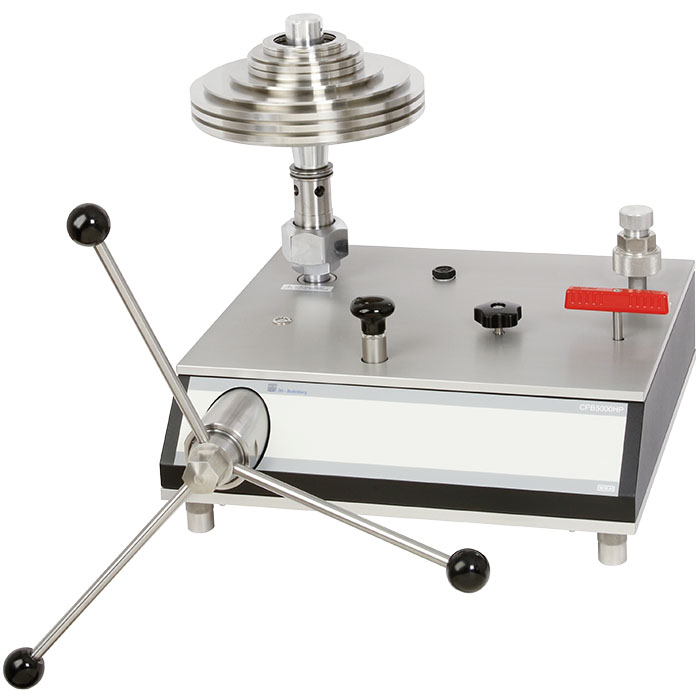 The pressure balance (dead-weight tester) has therefore been used for years in factory and calibration laboratories in industry, national institutes and research laboratories. Due to its integrated pressure generation and the pure mechanical measuring principle, the model CPB5000HP is ideal for on-site use for maintenance and service. Pressure is defined as the quotient of force and area. The core component of the CPB5000HP is therefore a very precisely-manufactured piston-cylinder system, which is loaded with masses in order to generate the individual test points. The masses applied are proportional to the target pressure and this is achieved through optimally graduated masses. As standard, these masses are manufactured to the standard gravity (9.80665 m/s²), though they can be adjusted to a specific location and also DKD/DAkkS calibrated.